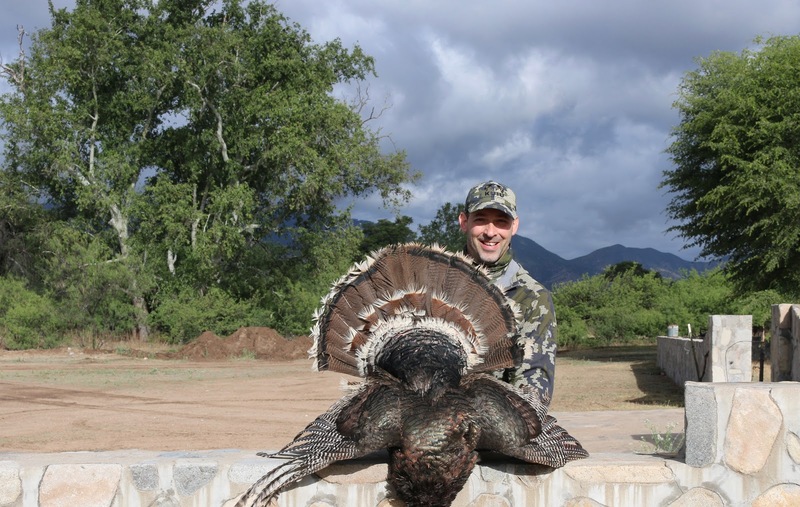 Ed Kirkwood was able to harvest two Goulds turkeys with us in Mexico. The video above is from his second bird. Congrats Ed on a successful hunt! Tim Cooper and his wife Vicki came out from Arkansas to complete Tim's Royal Slam. We had some great hunts and he was able to harvest 3 beautiful Goulds turkeys. His first bird was on the first morning after a big rainstorm from the night before, the bird came in all slicked down and wet but curios enough to get shot. An hour later we made a mid morning setup on some birds and had three different gobblers come in. Tim shot the one with the longest beard. For our evening hunt we had a great setup in a canyon bottom and Tim's gobbler came and beat up the DSD jake decoy. It was a pleasure to hunt with such fine people as the Cooper's! Jonathan Snead returned for a second year in a row and harvested two Goulds turkeys with his bow and arrow and made two perfect head shot with his Magnus Bullhead broadheads. Guide Chris Roe was with Jonathan on both of his harvests this trip. The videos are a must watch for any bowhunter! Watch as Lance Johnson attempts to complete his Royal Slam with his bow and arrow. This is the first afternoon hunt with guide Chris Roe and other Hunter Mitt Wardlaw. Watch the video above as Mitt Wardlaw executes a perfect head shot with his bow and arrow on this Goulds turkey completing his Royal Slam! He was hunting with guide Chris Roe. Bozo Ward from Mississippi was able to finish his single season World Turkey Slam with us in Mexico. He ended up harvesting three Gould's gobblers. Congratulations to Bozo on his single season World Slam! Multi State Champion Turkey Caller Chris Coffey came to hunt with us and wanted to fulfill his double Royal Slam with two Gould's turkey. He did just that and harvested a double bearded tom see the photo below! Chris is one of the best callers we have ever hunted with and it was a pleasure to seem him work the birds. Chris also treated us to his secret recipe for cooking wild turkey and it was tasty! We had a fabulous hunt with Stephen Pitts and Tony Beverly and they were able to complete their Royal Slams with us in Mexico. The first morning we doubled off of the roost as you will see in the first video. They brought their wives on the trip and we had a great couple of days enjoying the mountains of Sonora. Guide Chris Roe is pictured here in the middle of Tony and Stephen.